In the fall of 2018, Assistance League issued a call to action to all chapters to participate in a nationwide effort to raise awareness of the importance of promoting childhood literacy and putting books in the hands of children who might not have access to them. Assistance League ACTION! Week was officially celebrated February 25 – March 3, 2019. 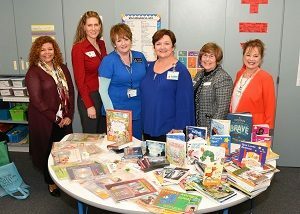 Beginning in December and continuing through February, students who were referred to three area Kohl’s locations at Baybrook in Friendswood, League City, and Fairmont Parkway in Pasadena, as well as the Galveston Island Target, were given the opportunity to select two books when shopping for school apparel. One thousand books were placed in the hands of these students in six school districts. At the end of the 2018 calendar year, the Albemarle Foundation awarded the organization a sum of money to the chapter. A portion of those funds, voted on overwhelmingly by the membership, were allocated towards the purchase of Spanish audio books for patients, who are simultaneously students, at the Galveston Shriners Hospital in their Burn Unit. Over 150 books in print as well as Spanish audio books were donated on Thursday, February 28, coinciding with the designated time frames for Assistance League ACTION! Week. Students from all over the world, but in particular Mexico, Central and South America, are brought to this location to recover from their injuries. Many of these students have never been exposed to any type of formal classroom experience. Some cannot read or write. With Myra Sanders, classroom teacher, and Veronica Villarreal, teacher assistant and translator, they are given the opportunity to learn. Of particular importance are the audio books as often, patients spend their initial time in intensive care. These books can provide entertainment and perhaps a few moments of pain relief. Through ongoing partnerships with community supporters, Assistance League of the Bay Area successfully completed the mission of Action! Week, raising awareness of the importance of literacy.